Within hours after my first baby’s unexpected and devastating stillbirth, I decided I wanted to donate my breastmilk. I wanted Finnigan’s life to mean something, for something good and right to come out of such heart-rending sorrow. Helping other babies live on through Finnigan’s gift of milk felt exactly right. Finnigan was born and died on a Monday. My milk did not come in until Friday, and my mom remembers me saying “I hope my breasts work.” They did, and I remember seeing the milk spray and being glad that I could do this–glad in a fierce and sad way. Pumping breastmilk four times daily was one physical thing that I could do that I would have done for Finnigan (except obviously I would have nursed him & more frequently). It connected me with being a mom, that I really was a mother. It also grounded me in the reality that this was not some horrible nightmare from which I could wake up, and my tears would come often as I was pumping. Other times I could imagine the other babies who would enjoy my milk. I donated some milk to the Mother’s Milk Bank of Ohio, as that was what was available at the time, and gave about 3 months worth. Tiny, pre-term babies only eat 1 teaspoon or less per feeding, and I was averaging 25 to 32 ounces a day. Finny’s milk fed tens of tiny babies, and helped their families through a difficult time. 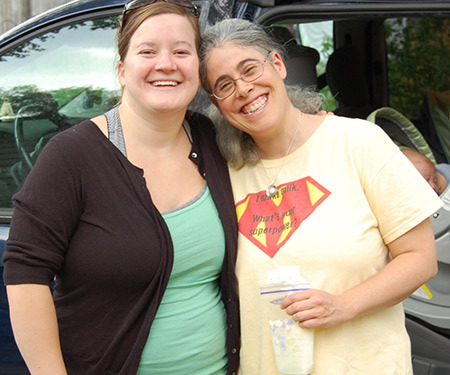 I gave some milk to my midwife, and she used it to help two local babies. It helped me to know that these babies turned around (one little one was close to being hospital-bound) and that our gift of milk was useful and making a difference. Then we connected with Becky and her little baby boy Cameron. I was able to give her enough of Finnigan’s milk to supplement her own supply so that Cameron did not have any formula and had breast milk through 20 months of age. 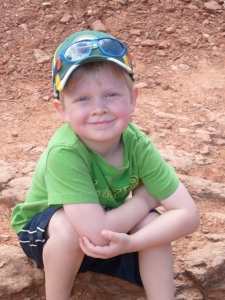 It is good to see how strong and healthy Cameron is, and that we helped him get a good start in life. We call this Finnigan’s gift. It was really from our whole family–my husband David supported and honored my daily routines of boiling bottles, cleaning the pump, pumping breastmilk and donating it. Days before Shiras was born in October 2007, I received the biopsy results: cancer (again). My doctor “gave” me six weeks after birth before I would have to undergo a series of surgeries on my chest. I had to jettison most of my expectations for the next six months: goodbye to baby-wearing (my skin graft couldn’t take the pressure), goodbye to hours in a rocking chair with body and eye contact (I didn’t have the strength and was in too much pain), goodbye to co-sleeping (I was too drugged to be a reliable bed companion to an infant), goodbye to lazy days for bonding (I spent those days in a blur of phone calls with doctors, social workers, and insurance folks), and goodbye to breastfeeding (too many drugs in my system). When I think of that time, it isn’t with sadness or loss over “giving up” all my expectations. Instead, that time reminded me of what is important in my life: love for the family and friends who moved in to help care for and comfort my baby; appreciation for the privilege of first-rate medical care and providers (who wheeled me in to surgery with the breast shields on my chest to ensure the post-op dressings left room for me to pump-n-dump), and profound gratitude for the community of friends and strangers who brought food to my family. After Roman’s birth, even though simply thinking about him could put a smile on our faces, we quickly realized that the love we felt was coupled with an overwhelming anxiety of our darling boy ever being sick or being hurt in any way. Those anxieties were realized when the pediatrician thought Roman presented as jaundiced. He was tested, and Roman’s bilirubin levels were very high and he required a bilirubin blanket. We were instructed to keep him hydrated in order to reduce the bilirubin level in his system. This meant frequent nursing. Roman, however, was not nursing well. He was not latching and he was not sucking. When Roman’s bilirubin levels were checked again they had elevated. He needed to nurse frequently and he wasn’t able to get what he needed at the breast. We didn’t want to give him formula because it would not have provided the same nutrients for our baby. We were feeling helpless and scared. Our midwife immediately knew to bring us donor milk. She had informed us of the thorough screening performed on the donors. We trusted our midwife with our health, the birth of our child, and the health of our child. We used the donor milk for two days until Roman was able to get the amount of milk he needed from his mother’s expressed breast milk. After one day of using the donor milk, Roman’s bilirubin levels went down dramatically and he was able to take off the bilirubin blanket. I am eternally grateful to the Mothers’ Milk Alliance for their support after the birth of my daughter. I had what I would consider to be the perfect home birth and thought my only connection to a milk bank would be as a donor. I was able to breastfeed immediately after having our baby, but then I hemorrhaged and needed to be transferred to a hospital. Due to my condition, there was no time to discuss the impact any interventions would have on my breast milk. 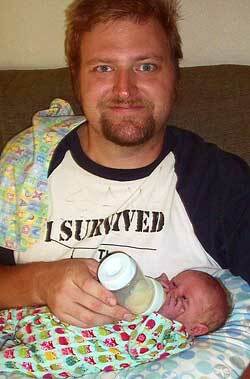 Fortunately for us, I was able to breastfeed as soon as I was in recovery. I was relieved to find that my midwifery team had brought donor milk “just in case.” They taught my husband how to syringe feed our daughter which he used over the next few days to supplement my milk. Ella was nearly 12 lbs at birth and would nurse constantly which was difficult for me, since even after multiple blood transfusions I was anemic and exhausted. It is reassuring to know that everyone was looking out for the best interests of our baby and she had access to breast milk even when she did not have access to me. I am very thankful that there was donor milk to help our Ella get a good start. Evelyn and Finnegan were born healthy on September 20, 2010. Breastfeeding started out great, both babies knew exactly what to do and we had no challenges with latching. On the second day we were in the hospital, we discovered that Evelyn and Finnegan had each lost 8% of their body weight. 3 nurses and 1 doctor instructed us to start supplementing with formula until my milk came in. I was devastated to say the least. I started crying and said, “I’m trying my best.” Formula had not been part of our plan, but we felt that we had no other choice. The days that followed brought many challenges. I pumped at home only to find that my milk was still not coming in. We had to keep giving our babies formula. I knew how important it was for newborns to receive breast milk first, how it completed their digestive system and created their immune system. I felt crushed that I wasn’t creating what my children needed. But slowly, my milk came in. After numerous visits to the lactation consultant, dietary supplements, prescription medications, after eating whole grains daily, drinking gallons of water and constantly having either a baby or a pump on my breast , my milk came in. I made enough milk for 1 baby, so we split it up. Half breast milk and half formula. That was the way it was going to be, but I was still having a hard time coming to peace with it. In the mean time, I found out that we could buy human breast milk. I had no idea! When I was at the hospital, I was never informed of this. Another woman’s breast milk was never presented to me as an option…. One that I would have gladly welcomed. The cost was too high though. We could never afford it. That is when I found out about Mothers’ Milk Alliance. My babies were about 3.5 months old at the time and I was not sure if I they could become recipients. I thought that maybe they would already be too old or since I made some breast milk they would not be able to receive any. The midwife at MMA was so kind and informed me that we could receive breast milk! I was so amazed by her generosity and all the women who donate to the milk bank. These are women who have very busy lives and still take the time out to pump for someone else’s baby. These are women who take the time out of their lives to be tested for communicable diseases. The kindness brings tears to my eyes and a smile to my face. You who should be in my arms, live forever in my heart. You live in each breath I take, each flower that opens in your garden, and each drop of my milk that helps others grow strong. Your story is one of loss and survival- of connections and hope.